Phablets started with the Samsung Galaxy Note in 2011, and the 5.3-inch monster phone scared us at the time with its size. But while we thought that was the limit, Samsung surprised us by bumping the display to the whopping 5.5 inches in 2012, and in 2013 rumor has it, the company will go even further by equipping the Samsung Galaxy Note III with a 6.3-inch display. This rumor comes along with talks of Samsung beginning a restructuring in its LCD unit, which should translate in cuts in production in favor of OLED. “With money saved from LCD restructuring, the firm plans to spend more on OLED and flexible displays,” a parts supplier told the Korea Times. This will allow Samsung to differentiate in the space and focus on organic LED displays. Samsung is using the AMOLED technology in its high-end products, and the Galaxy Note II comes with a 5.5-inch Super AMOLED screen. Too big. 2014 we will have 7 inch Note IV. Hey I kinda like this. This is something I would jump on in an instant. Imagine 6.3" 1080p Super AMOLED RGB HD screen on a bezel less device. It would be no bigger than the Samsung Galaxy Note II. Wow let's see if this does materialize! If its the size of the note 2 then I'd also be interested. Making the device bezel less its quite possible of having a 6 inch screen at least on the note 2 size chassis. Any bigger than the note 2 then I'd say no,it'd no longer be a phablet its a full blown tablet at that stage. Yes that is what I am saying. 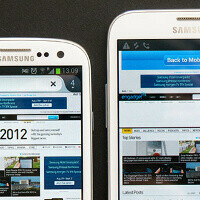 I just want to see how Samsung evolves from the VERY awesome Samsung Galaxy Note II. Would you like it too if the tablet size hits 15' with 1900p or whatever?? Absolutely NO FREAKIN WAY!!!!!! it will fit in my pocket!!! NO FUDGING WAY!!!!!!!!!!!!!!!!!!!!!!!!!!!!!!!!!!!!!!!!!!!!!!!​!!!!! If the Note III has a 6.3" that has a 10:16 width by height ratio, then mathematically, it couldn't fit within the same body. The screen would measure 3.338993 in. by 5.342389 in., which would make just the screen wider than the Note II and Samsung's engineers would have to be very creative to fit the earpiece and the front camera within the same height as the Note II even with on-screen buttons. If it is a 9:16 ratio, the screen can exist within the same body as the Note II, but it is also unlikely. The side bezel would have to be less than 7.135/100ths of an in. (that is extremely annoyingly small). the screen would measure 3.08865 in. by 5.4909 in. Again, the trademark capacitive/solid button combo would have to be nixed and the engineers would have to conjure up some wizardry to fit an earpiece and a front camera within the same space as the Note II. To me, the Note II is the very limit for pocket comfort and this big of a screen, would make the Note III noticeably bigger. Save yourself some time and don't question my math. Trust me Google would be laughed off the stage against Samsung. Google better stick to it's boring stock Nexus devices. They are already a joke compared to the Galaxy devices from Samsung. Google needs to stay in it's lane otherwise their doors will be seriously blown off by Samsung. Do you ever think before you post. Seriously, you never have an insightful thing to say. Like you are so informative. Please my brother don't make me laugh at you anymore than i already am. hmmm but Sony is also into this madness ... rumoured to be attempting a 6 inch "phone". would palm-detection technology help alleviate that problem? This is nothing but unfounded rumor. The current size of Note is proven and there's no point for SS to change the successful formula. But SS may try new 6" size but then I'm sure they would call it something else not Note 3. We can all thank Hauwei for the spec war. They have decided to try to take out the Galaxy Note 2 knowing full well they should've backed off. Now Samsung the leader in this created market will now just BLOW EVERY OUT OF THE WATER. The Galaxy Note 2 is a very special device nothing today is better and nothing will be for the next 5 to 6 months. You can rest assure that The upcoming Galaxy Note 3 will be industry leading in Oct 2013 just as the Galaxy Note 2 was in 2012. Copy cat manufacturers need to take a seat cause nobody will top Samsung in the software and features department. Sweet. Thanks for the tip. I'll bypass the Note III and get the Note IV. Finally a phone big enough to do all the things on it that it CAN do and for your eyes to actually be able to see. That does seem awfully large for a phone. Little small for a tablet.